Just two years after completing Crime and Punishment, which explored the mind of a murderer, Fyodor Dostoevsky produced another masterpiece: The Idiot. This time the author portrays a truly beautiful soul and one of Dostoevsky's greatest characters---Prince Muishkin, a saintly, Christ-like, yet deeply human figure. The story begins when Muishkin arrives on Russian soil after a stay in a Swiss sanatorium. Scorned by St. Petersburg society as an idiot for his generosity and innocence, the prince finds himself at the center of a struggle between a rich, kept woman and a beautiful, virtuous girl, who both hope to win his affection. Unfortunately, Muishkin's very goodness seems to bring disaster to everyone he meets. The shocking denouement tragically reveals how, in a world obsessed with money, power, and sexual conquest, a sanatorium is the only place for a saint. This version of The Idiot is the translation by Eva Martin. Norman Deitz ruined this great book for me. He attempts to change his voice depending on who's speaking, with miserable results. Dostoevsky doesn't even require voice acting to be incredible. I couldn't get into this version at all (which I've read myself in the past and loved--hence the 5 stars for "Story"), couldn't last more than 15 minutes in fact, all because of the narrator. I wish I could get my money back or get another version of the same title. What didn’t you like about Norman Dietz’s performance? Also, the narrator is outstanding. I am looking for more of his work and will likely purchase at least one more book simply to listen to him voice the characters. I truly think he is one of the greatest readers I have ever heard. At once 'The Idiot' is a complicated, beautiful and yet ultimately a somewhat flawed novel. Written shortly after 'Crime and Punishment', it seems like Dostoevsky wanted to invert Raskolnikov. Instead of a mad killer, Prince Myshkin the 'Idiot' is an innocent saint, a positive, a beautiful soul and holy fool motivated by helping those around him. He is a Christ in an un-Christian world, a tortured Don Quixote. Dostoevsky is able to use Prince Myshkin's spiritual intelligence and Rogozhin's passion to illuminate the main problems and idocyncrasies of Russian society. But the story still falls a bit short of perfection. It literally falls between 'Crime and Punishment' and 'Brothers Karamazov'; failing to achieve the simple greatness of 'Crime and Punishment' and the complex greatness of 'Brothers Karamazov'. Like Myshkin himself, the novel's intent is nearly perfect, but the execution is just a little off, a little unstable. That doesnt mean I didn't love it. As a novel I adored it. I was both taken by and frustrated with Prince Myshkin. Perhaps my favorite parts of this novel fall into the scenes where Dostoevsky is focused on a painting or an execution. He isn't content with a superficial look at the world. He examines things for depth and poignance that actually left me shaking. He studies Holbein's grotesque 'The Body of the Dead Christ in the Tomb' with a patient, detailed eye that at once appears to capture the whole life and death of Christ. He describes the beheading of John the Baptist; looking for details of his face in that still and eternal second before his execution. In this Dostoevesky is recreating his own near execution and the horror and magnificence that death (or a near death in Dostoevsky's case) brings to a person's fragile, beautiful and flawed life. 9 sur 15 personne(s) ont trouvé cet avis utile. I got about halfway through the book until I gave up on it. The narrator is what ruined the story for me due to his delivery and the specific voices he gives to characters. All of the women's voices were performed as if they were airheads with the voice of Snow White, and the protagonist is performed with an annoyingly infantile and unconfident demeanor that is exaggerated more than it should be. I realize the protagonist is characterized as an idiot but the narrator takes too much liberty and goes too far. it's a Russian soap opera. how has it survived? that I wonder if he ever met an actual human being. It's as though he is guessing what drives people to do things and how they will react to situations based on a two week study of humanity. And how the man drones on and on and on. Shut. Up. Already. Characters lacking identity and creativity--that's the point! Dostoevsky's characters are confused and confusing, because they have no national identity to relate to. They aren't even hypocrites, because they haven't the motivation to be. Yet they contradict themselves from one moment to the next, even to the extent that they love one minute and hate the same person the next. Politically, morally, and socially, they "try on for size" any idea that they whiff in the breeze. When a problem needs solving, they grapple at ineffectual, fanciful, childish solutions, much like some of Chekhov's ineffectual characters. 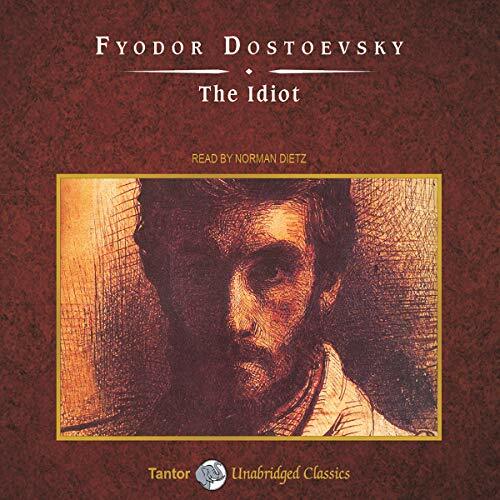 In The Idiot, characterization isn't simply a matter of good-versus-evil, a theme Dostoevsky is famous for mastering, but it is a matter of depicting a crisis in the Russian mind or education. Many characters in this novel make Mrs. Bennett in Pride and Prejudice seem like a superb intellect. Approaching the novel with this orientation certainly helps readers to appreciate the masterful characterization. Norman Dietz's narration is great. The moment I began to listen to him, I knew this was a good choice. Now that i reflect on the story, I am reminded that the Prince has been educated outside of Russia, as are many characters in all of Russian literature. In fact, English, French, and German universities were favorite choices for the sons of Russians with money, a fact that tied their experiences to other European cultures--and confused their own with a smattering of foreign words and ideas. Think of it! What use had a Russian for the ramblings of Rousseau? Voltaire? Madame Pompadour? Yet Dostoevsky's characters are fond of quoting "Apres moi me deluge," a fatalistic expectation--if they get the sense of it. Dostoevsky did. This is the first review I have written. I have been a member since 2006 and this is the first book I just could not finish listening to. It was long and drawn out with no direction. I'm not even sure what the story is about, it seemed like just high tale gossip. It was much to boring for me. 0 sur 12 personne(s) ont trouvé cet avis utile.